Elder Joseph E. Fisher, the son of Dessie Fisher and the late J.B. Fisher, Jr. of Milwaukee, Wisconsin, was born into the Temple family while it was under the direction of Elder S.B. Grimes. He grew up under the teachings of Elder Johnnie Brown, Elder R.L. Williams, Jr, and the late Elder Elvis Fuller. He accepted his call to the ministry in March 1986, where he served at Temple under Elder Lee O. Head, Jr. He was ordained an elder in August 1987. Pastor Fisher also served under Elder Thomas Jackson. Pastor Fisher was installed as the pastor of the Temple Church of God in Christ in August 1989, and was appointed as the superintendent of the Parsons District in January 1991. Pastor Fisher is a graduate of Riverside High School in Parsons. He received his baccalaureate degree from Tennessee State University, and his masters degree from the University of Tennessee at Martin, Doctoral Degree from the Midwest College of Theology. In the early 1970's in Milwaukee, Pastor Fisher met Miss Calla B. Woodard. They were married in 1974. Some of Pastor Fisher's ecclesiastical roles are as a member of the Executive Board for Tennessee Central Jurisdiction, the Dean of the W.L. Porter Institute for the jurisdiction, Chairman of the Ordaination Board, as well as Superintendent of the Parsons District. 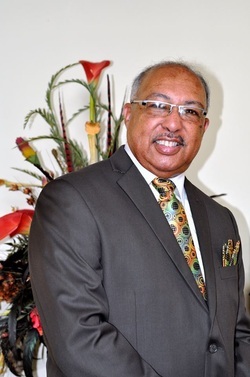 Pastor Fisher is has recently retired from the State of Tennessee as the Assistant Commissioner of Education. Pastor Fisher is also a member of the city council and the Vice-Mayor of the City of Parsons. Pastor Fisher serves on various committees and boards for church and civic related reasons, including as a director on the Board of Directors for First Bank. Pastor Fisher is a devoted husband, father, and grandfather. Pastor Fisher has three children: Juan (BeauJean) Fisher, Carissa (Larry) Crismon, and Cami (James) Casey, and eight grandchildren. ministering, worshipping, working and witnessing institution. We have a long history of reaching lost men, women, boys and girls for Jesus Christ, and at our very best, we are the family of God. It is His purpose that we serve. It is at His command that we march. It is into His kingdom that we invite others. We are proud to call Him our Father and the Great Head of "The Temple Worship Center". nostrils the breath of life; and man became a living soul. And the LORD God planted a garden eastward in Eden; and there he put the man whom he had formed. Saints my prayer for you this year is to be a year of great achievements. We have endured. Now we must achieve. Someone said it right that, when God sets you back, He’s setting you up for a comeback. God always has a purpose for what He does. In the word it is clear that God does not create man until after the garden was thoroughly furnished. God had it planned. God had it planted. The Garden had in it everything God intended. Then He made the man. Likewise, God has set things up for you and me. We are not where we are by accident. We are not built the way we are by happenstance. We have been put here on purpose. Furthermore, we have been put here for a purpose. Adam was not completely aware of his purpose the day he was created, but God knew. .....And the LORD God planted a garden eastward in Eden; and there he put the man. God didn’t need a garden, but the man needed a place to live while he achieved God’s purpose for his life. God has provided considerably for our needs in order for us to find and achieve His purpose for our lives. As with Adam, our gardens were planted before we got here. Likewise, as with Adam God gives us responsibilities for preserving our environment while we discover and achieve His purposes for our lives. beginning....God said unto them, Be fruitful, and multiply, and replenish the earth, and subdue it: and have dominion over the fish of the sea, and over the fowl of the air, and over every living thing that moveth upon the earth (Gen1:28). Life is meant to be fun, fruitful and fulfilling. Therein lies your purpose. You are to be in charge; the head; on top; the boss of your garden. Yours is intended to be a life which bears God-sized fruit, and best of all, you are to have fun achieving it. God has provided everything you will need to get it done. With each new level of achievement, He promises the needed blessings. In short, as long as you are pursuing God’s purposes God’s way, the blessings will keep coming.